In 2016, Alexi was awarded an Avery Fisher Career Grant! Alexi performed on Show 200 recorded in Wolfeboro, NH, on July 8, 2009, at age 15. He also performed on Show 322 in Davis, CA, on March 18, 2016. Alexi Kenney (violin) is from Palo Alto, California. 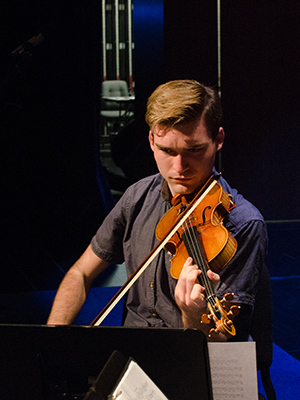 Currently, he is an artist diploma candidate at the New England Conservatory in Boston, where he studies with Donald Weilerstein and Miriam Fried on the Charlotte F. Rabb Presidential Scholarship. He is the recipient of top prizes at the Yehudi Menuhin International Competition in 2012, the Mondavi Center Competition in 2010, and the 2013 Kronberg Academy Master Classes. He appeared on NPR’s From the Top with Host Christopher O’Riley on Show 200 in Wolfeboro, New Hampshire, in 2009.